WHEN Peter and Allison Cairns and their six children decided to pack up their life on the Gold Coast and hit the road less travelled, they had no idea of these two things - the experience that was to await them, and the four other children who would be born along the way. What was originally planned as a five year trip has now turned into almost nine, with the extra large Cairns family now well into their third lap of Australia. "We used to drive a Tarago but we outgrew that," Mr Cairns, a refridgeration mechanic by trade, said. 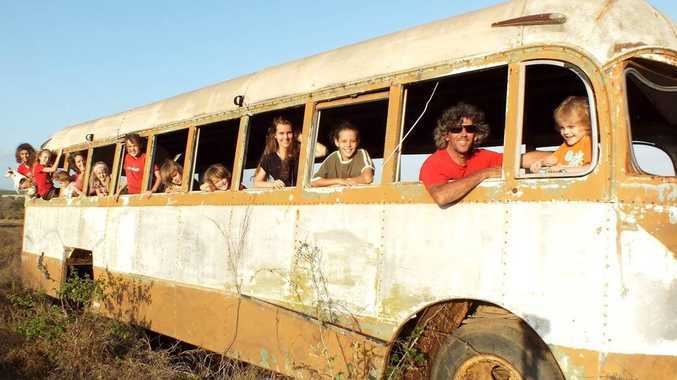 He said after struggling to find an appropriately sized campervan, they purchased and renovated an old 40-foot bus and have travelled to just about every part of the country excluding Tasmania and Victoria. And now with 10 children, aged 1, 4, 5, 6, 8, 10, 12, 13, 14 and 17, life gets very interesting. "You don't notice (how big the family is) until around breakfast time, lunch time and bath time - they are the most hectic parts of the day," Mr Cairns said. Never anticipating a family of this size, Mr Cairns said the family unit grew again once they hit the dusty trail. "Our littlest girl was born in Kalgoorlie - she's a gold country baby," he said. They also had children in Lismore, Cairns and Darwin, where Mr Cairns finds work to fund the family's adventure. To follow their journey, visit www.facebook.com/holidayroad.